Marion Dickerman was born April 11, 1890, in Westfield, New York. She studied for two years at Wellesley College before transferring to Syracuse University, where she was an avid supporter of woman's suffrage and campaigned for protective labor legislation for women, the abolishment of child labor, and world peace. A strong, committed student, Dickerman received her bachelor of arts in 1911 and a graduate degree in education in 1912. 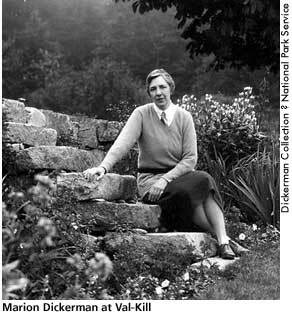 After a brief teaching assignment in Canisteo, New York, in 1913 Dickerman moved to Fulton, New York, where she taught American history and became reacquainted with Syracuse classmate Nancy Cook, who taught arts and handicrafts at Fulton High School. The two women would become lifelong partners, living together almost their entire adult lives, sharing a life dedicated to politics, education, and progressive reform. When they returned home the following August, Dickerman was amazed to learn that the Joint Legislative Committee and progressive Democratic leadership in Fulton had selected her to oppose Thaddeus Sweet, the anti-woman suffrage Republican speaker of the New York State Assembly. Dickerman had no chance of winning the election; however, with Cook as her manager, she siphoned away enough votes to prevent Sweet from becoming the Republican gubernatorial nominee. In 1921, Dickerman accepted a position as dean at the New Jersey State College in Trenton and spent the summer teaching English at Bryn Mawr's Summer School for Women Workers. Unhappy, she looked for a job she loved closer to New York City, where Cook had moved to accept a position with the State Democratic Committee. By summer 1922, Dickerman had moved to New York City and joined the faculty of the Todhunter School. Dickerman met ER in June 1922 when Dickerman accompanied Cook, then the executive secretary of the Women's Division of the State Democratic Committee, to Hyde Park for a weekend visit. The three women, sharing political ideas and tremendous energy, became fast friends, working together for the Women's Trade Union League, the League of Women Voters, and the Democratic National Committee. As ER recalled in her autobiography, "Miss Cook and Miss Dickerman and I . . . had been from the first drawn together through the work which we were doing together. This is, I think, one of the most satisfactory ways of making and keeping friends. "(2) By 1927, in addition to their political work, the three women would share the Val-Kill property, Val-Kill Industries, and the Todhunter School. Their friendship would last more than fifteen years. Dickerman and Cook prided themselves as diplomatic workers in the sometimes difficult relationship of ER and FDR. Eventually Dickerman's allegiance appeared to ER to favor FDR. By 1932, ER had other new friends like Lorena Hickok who actively disliked Dickerman, and Dickerman, elated by FDR's victory, could not appreciate ER's great anxiety over moving into the White House. By late 1933, as ER's responsibilities introduced her to a wider world and her interests and friendships expanded, she had less time to spend with Dickerman and Cook. By 1936, when Val-Kill Industries dissolved, ER moved out of Stone Cottage, which she shared with Dickerman and Cook, and had the factory building remodeled for her private space where she could entertain without imposing on or involving Dickerman and Cook. (3) When Dickerman sought ER's active help in securing a loan from Bernard Baruch to expand Todhunter, ER, who worried about the wisdom of expanding the school when the economy was not strong, refused to invest in the expansion and was relieved when the deal fell through. The next year, when a professional fundraiser Dickerman hired to promote the school wanted to say that ER would return to Todhunter and make it one of her major interests after the White House, ER refused to cooperate. Dickerman continued to be active in Democratic politics and, as an alternate delegate to the 1940 Democratic convention, helped secure a isolationist plank in the foreign policy platform sought by FDR. After FDR's death in 1945, Dickerman and Cook moved to New Canaan, Connecticut, where Dickerman directed educational programing for the Marine Museum. She died May 16, 1983 in Kennett Square, Pennsylvania. Eleanor Roosevelt, This Is My Story (New York: Harper & Brothers, 1937), 346. Dickerman and Cook lived in Stone Cottage until 1947 when they moved to Connecticut. Eleanor Roosevelt to Marion Dickerman and Nancy Cook, December 29, 1938, AER Papers, Franklin D. Roosevelt Library, Hyde Park, New York. Quoted in Blanche Wiesen Cook, Eleanor Roosevelt: Volume Two, 1933-1938 (New York: Viking Press, 1999), 530. Cook, Blanche Wiesen. Eleanor Roosevelt: Volume One, 1884-1933. New York: Viking Press, 1993, 320-333, 397-402. Cook, Blanche Wiesen. Eleanor Roosevelt: Volume Two, 1933-1938. New York: Viking Press, 1999, 136-7, 360-2, 526-537. Lash, Joseph P. Eleanor and Franklin. New York: Signet Press, 1971, 375-6, 623-7. Roosevelt, Eleanor. This Is My Story. New York: Harper & Brothers, 1937, 346 -347.